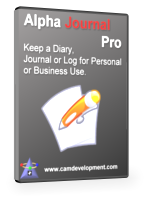 CAM Development - Diary and Journal Software Products. Welcome! Here you will find our journal and diary products, Alpha Journal Pro and My Personal Diary, as well as our keyboard shortcut program, Alpha Key Saver. My Personal Diary and Alpha Journal Pro are similar products, aimed at different types of users. 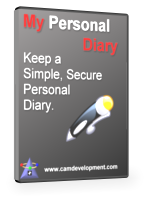 My Personal Diary is simpler, with the home user who wants to keep a simple daily diary in mind. Alpha Journal Pro adds on, with business and power users in mind, allowing multiple users to securely access an entry database and supports synchronization with other entry databases and a web-based companion used for writing while away from the desktop. Both offer optional password protection, advanced searching, multiple entries per day, non-dated entries, categories and more. You can see a feature comparison here.